Babies are incredibly vulnerable to bacteria, up until they are at least one year old, their feeding essentials require sterilising. 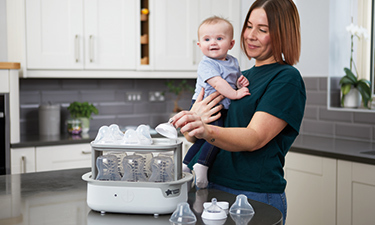 That is why safe and effective sterilisation of baby feeding products is vital in baby's first year and it is important that retailers can offer the type of steriliser to fit the lifestyle and type of products that Mum is using. As a key sterilisers distributor our range includes microwave, cold water, steam, travel and mini sterilisers. Only the most reliable and trusted brands including Philips Avent, Dr Brown, MAM, Milton, Tommee Tippee and Munchkin Innosense, Babymoov are held in stock. Our selection of sterilisers delivers against the key parents’ demands. They are BPA Free, easy to clean, easy to manage and are compatible with the bottles and baby feeding equipment available at Baby Brands Direct. In the recent years, a few key phenomenons have been observed. For instance, as a result of growing research, sterilisation on its own has grown immensely in importance. Considering the growing healthy lifestyle trends along with parents spending power at its peak, retailers can nowadays capitalise on sterilisers that have become one of the top parents buys. As a leading baby wholesaler, Baby Brands Direct product offering ensures competitive price points to assist in fostering your business development. You can rely on us to fulfil your demands and dropship anywhere you are. Browse our pages to find out more.